← Is it a bird? Is it a stone? No! Our place, Moggill Haven, is situated in the Brisbane suburb of Moggill. 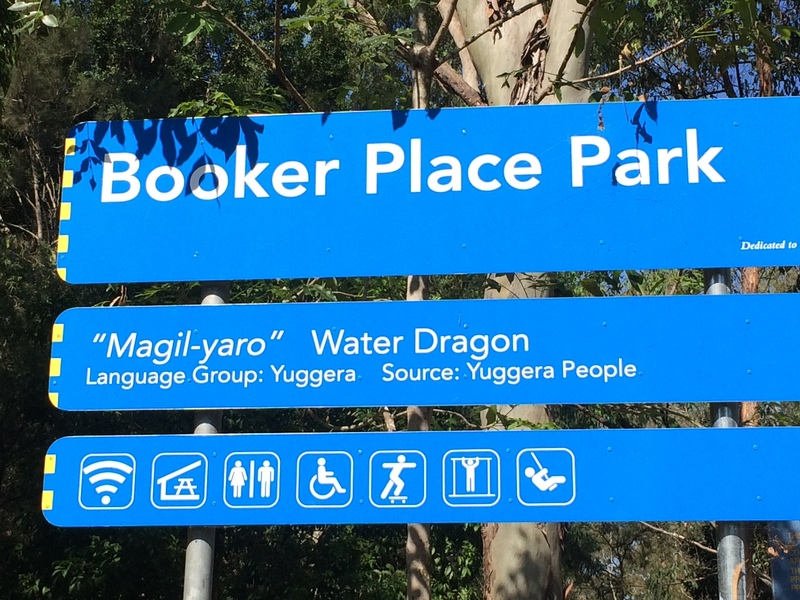 The Brisbane City Council has chosen an Aboriginal source for the meaning of Moggill as this sign at Booker Place Park in Birkin Rd Bellbowrie explains. 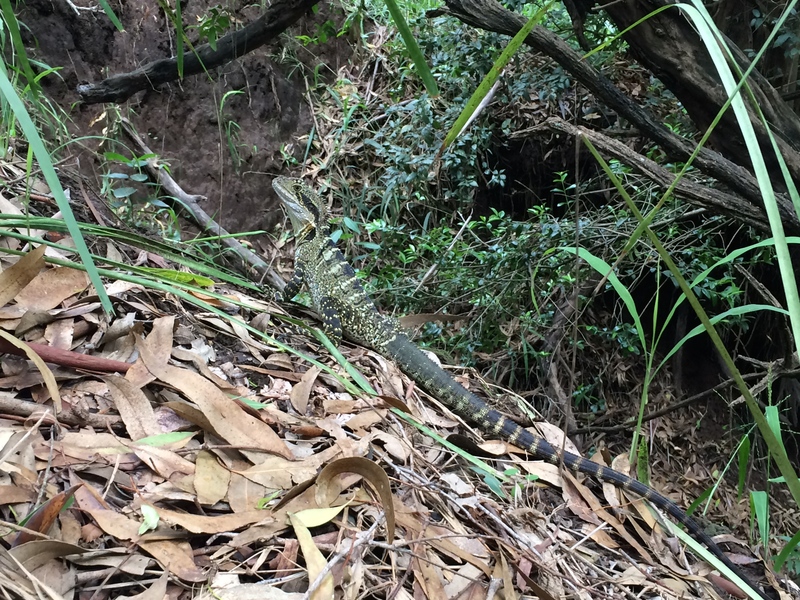 It is certainly true that when we are gardening down on the riverside we have seen some Eastern Water Dragons. They show no signs of fear but appear to watch us intently. However in the archives of the Moggill Creek Catchment Group I discovered there was another possible explanation for the name Moggill. On page 7 of the 2008 Autumn Newsletter of MCCG the editor, Graeme Wilson, included this snippet of information. Following the formation of MCCG we decided that we needed a logo. Someone told us that the origin of the name Moggill was that the Aboriginal name for the water dragon was magill. And so our logo became that animal, in spite of an opinion that our information was wrong: that originally there was a Moggs Hill. On a trip up river to Ipswich, about 1855, on the steamer “Swallow”, we called at a place which some people then spelt ‘Moghill’ and I thought what a strange name ‘Mog’ was for a hill. Moreover a friend of the editor provided him with a supporting account: The elderly locals informed us when we came in 1968 that a Mr Mogg had lived here in the 1840s, and the postal or delivery address became Moggs Hill. There are still people named Mog or Mogg in Ipswich. We may have been misled but a water dragon looks a great deal better than Moggs Hill as a logo! Both Moggill State School (established in 1866) and the Moggill Uniting Church (http://moggillhistorical.org.au/Transcripts/MoggillUnitingChurchHistory.html ) stand upon a high area that could most definitely constitute Moggs Hill. The hill was once the site of a large pineapple farm but now the Council has created 2 lovely parks for the recent housing developments on this high point. http://moggillhistorical.org.au/DescendantsOfMoggillPioneers.html gives a fascinating account of pioneering families living and working in the Moggill area. But it does not add any clarity about the original name and spelling of this area as the current spelling of Moggill is used throughout this booklet in line with its publication in 1988. 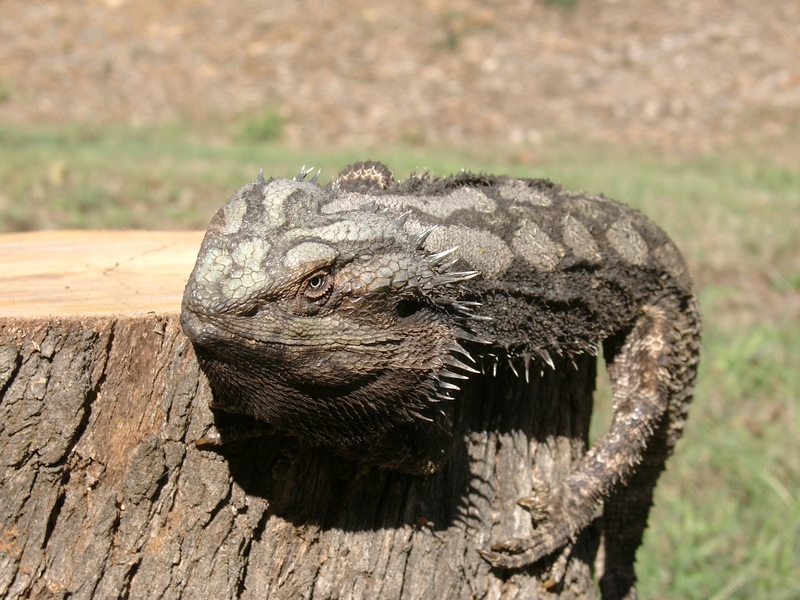 If you wish to learn more about the Eastern Water Dragon, Physignathus lesueurii, (and how it differs from the Eastern Bearded Dragon, Pogona barbata) the Queensland Museum has a fact sheet online. There can be some confusion between these two lizards as the following example shows. So even though it is difficult to tell from the school logo whether the image is of a Water Dragon or a Bearded Dragon, if the book published for the 125th anniversary of the school is correct (which links the name ‘Moggill’ with the Aboriginal word ‘Magill’) then the image on the badge is not a bearded dragon or a Bearded Water Dragon (there is no such lizard!) but rather the Eastern Water Dragon. We have seen both types of lizard at our place. The Eastern Bearded Dragons live on the top side of our property whereas the Eastern Water Dragons are found on the riverbank side. Whatever the origin for Moggill may be, we will continue to be enchanted by our encounters with Eastern Water Dragons. Eastern Water Dragon. How beautifully camouflaged is this creature ! This post will also function as a permanent page, The Meaning of ‘Moggill‘, under MoggBlog on the drop- down menu. This entry was posted in Diary: Rain and Planting and Observations of Wildlife and tagged bearded dragon, Brisbane City Council, Common Bearded Dragon, Eastern Bearded Dragon, Eastern Water Dragon, Eastern Water Dragons, Magil, Magill, Moggill, Moggill Creek Catchment Group, Moggill history, Moggill State School, Moggs Hill, Moghill, Water Dragon. Bookmark the permalink.